Green Arrow has the assassin who has been framing him for murder cornered. Unfortunately, it's at the site of the latest killing and there's an angry mob of sports fans that is all too aware of the Emerald Outlaw's presence. Black Canary has problems of her own, having been dragged into the manhunt for Green Arrow while in the middle of raiding the Seattle PD Evidence Locker for proof of his innocence! This is the first issue of Green Arrow post-Rebirth that I can honestly say was disappointing. There's no one simple reason for this- rather a culmination of smaller factors. The issue's artwork - usually a high point, as it is handled by one artist - is horribly inconsistent this time around, due to three artists working on the pencils and inks. Had they been artists with similar styles, this might not be so bad. Unfortunately, the depths of the inks and the quality of the line-work are continually shifting and the visual disorientation does not aid the flow of the story at all. I can't blame Ben Percy for the "twist' regarding the assassin in this issue. 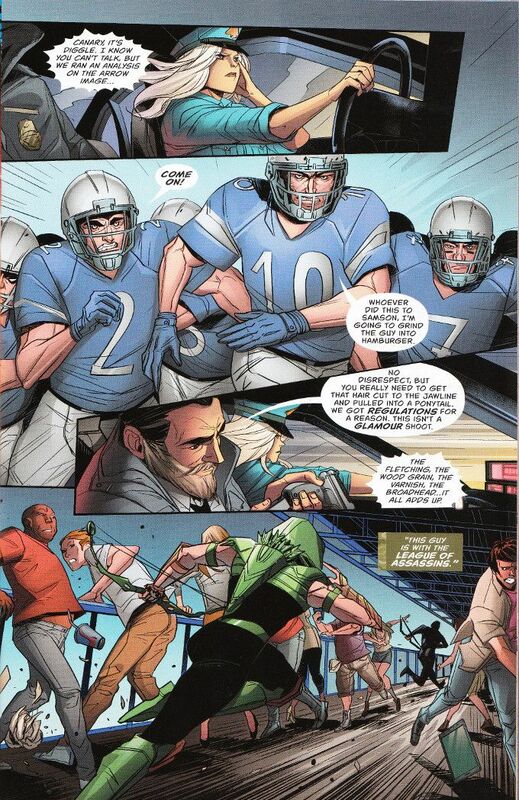 Doubtlessly he's having to make the best of a bad situation, with Green Arrow history in the modern era being a total mess thanks to the efforts of Scott Lobdell and Judd Winick. I can forgive Percy for the mess that has effectively "cloned" one character for the sake of continuity and reaching out to the Arrow fans. I cannot, however, forgive the fact that everyone in this comic is required to act like an idiot for the plot to work. This includes the assassin attacking people in front of witnesses who can attest that someone else was putting green arrows into people other than Green Arrow and the police captain who notices Black Canary's hair not conforming to the SPD dress-code yet doesn't think that's at all suspicious.